CHARLES RATCLIFF, A country boy from Northampton, started his working life as a gardener’s boy in the Bothy at Althorp House, the home of Earl Spencer. At the same time Alice Jones, a ‘townie’ from Barnes on the edge of London, served as Parlour Maid at the estate of Lord Normanton at Ringwood in Hampshire and then moved to Easthampstead Park, the country home of the Marquess of Downshire. We follow Charles and Alice as they move from place to place and eventually meet. We then follow them through the agonies of the Great War of 1914-18 when Charles the gardener found himself a soldier in the West Surrey Regiment fighting on The Somme. Set in the Edwardian era against a backdrop of some of the most prestigious estates in England, Alice and Charles’s story is a true upstairs/downstairs tale of a working-class English family from the death of Victoria in 1901 until the Battle of Britain in 1941. All of it is true and, with the exception of a few minor characters, all names are real. The conversations are, of course, imagined but are based on the author’s knowledge of the people concerned. Joan Blackburn was born in Woking in 1941. Her first book ‘Naafi, Knickers & Nijmegen’ was published in 2009 and told of her adventures in the WRAF between 1959 and 1963. 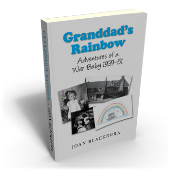 After the success of this tale of Air Force life in the swinging sixties, Joan was encouraged to go back a generation for her second book ‘Granddad’s Rainbow’. 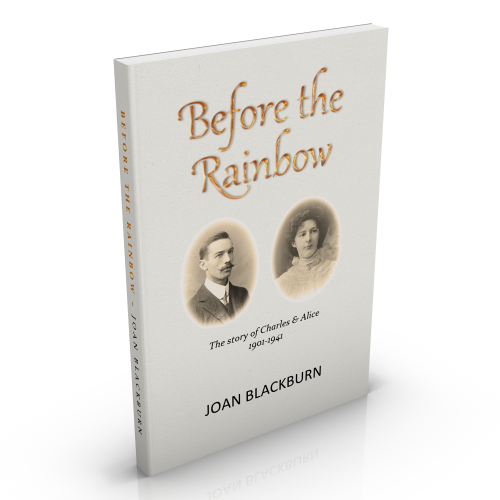 This told of life on the home front both during and immediately after the war and featured her parents, Lily and Stan. It is against the, fast disappearing, upstairs/ downstairs life of her grandparents where they worked for the gentry and also against the background of Stan’s life in the RAF serving in France and Malta and the steadfastness of Lily as she waited for him to come home. 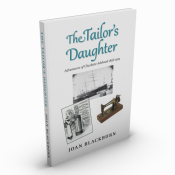 In ‘The Tailor’s Daughter’ Joan went back still further to the Victorian life of her Great Grandmother on Lily’s side of the family, who, in the 1880s set sail for New Zealand on her own. Lily’s maiden name was Gosley. Her grandfather married the plucky Charlotte Adshead and the decision they were forced to make, soon after their marriage, affected every generation thereafter. This trilogy of books cover 150 years of family history. Joan is married to Norman Blackburn and lives in West Sussex. She has two children, Catherine and David, and four small grandchildren, Jacob, Alice, Harvey and Keira.